Virginia will provide you with a date night experience straight out of a romance novel. From their quaint Southern towns to cozy bed and breakfast spots, Virginia never disappoints in the category of love. Here are 15 of the most romantic spots in the state that prove Virginia is truly for lovers. Old Town Alexandria is one of the most gorgeous historic districts in the state. On the edge of the Potomac River and minutes from Washington D.C., Old Town captures the charm and elegance of yesteryear. Walk on cobblestone streets and redbrick sidewalks to any number of events, parties, shopping, art shows, and attractions. For a perfect romantic date, take a walk down by the river before heading to the repurposed Torpedo Factory, now an art studio, and stop off at Bertucci’s for a wonderful Italian dinner. Church Point Manor Bed and Breakfast is a restored 1860s farmhouse. The manor is elegant and evocative, furnished with “European and American art and antiques.” The Manor’s 11 rooms are regularly booked, and for good reason—guests enjoy sitting in the piano room, tearoom, and strolling past the chef’s garden. One of the main attractions is the onsite fine dining restaurant, The Cellars. Make sure to book your stay early, as the Manor tends to fill up. The Salamander Resort & Spa in Middleburg, Virginia, is set on 340 acres in the Blue Ridge Mountains, right in the heart of wine country. The CEO describes Salamander as “opulent and homelike,” with an emphasis on opulent. Features include a full-service equestrian center, luxury spa, cooking studio, wine bar, billiards room, library, and zip line course. The spa includes 14 treatment rooms. Salamander aspires to fulfill your every need in one of the most beautiful locations in the Commonwealth. The Shenandoah National Park is one of Virginia’s favorite treasures, and the Skyland Inn allows visitors to take full advantage of all the Park has to offer. The Inn is located at Skyline Drive’s highest elevation and includes accommodations as diverse as small, rustic cabins and renovated suites. Each room offers a gorgeous view of the park, and access to everything the park has to offer. Book now for the spring season online. The Meadowlark Botanical Gardens are comprised of 95 acres of displays. 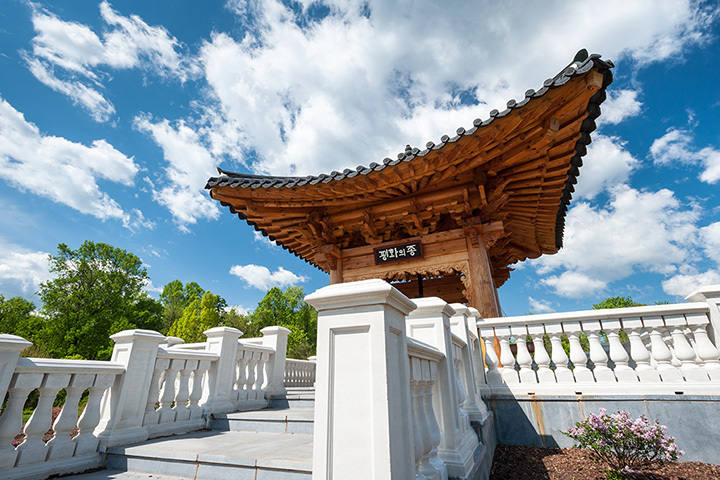 Nestled in the Piedmont hills, attractions include the Korean Bell Garden and the restored 18th century log cabin. In addition to taking in the flora and fauna, visitors can fish, boat, hike, walk the trails, and even play watersports. If you’re looking for a romantic place to dine, you could do no better than Meadowlark. Visit Thomas Jefferson’s wine vineyards near his home at Monticello in Charlottesville, Virginia, for a historic getaway. Wine Spectator magazine has recognized the vineyards for “one of the region’s most consistent track records.” Not only is the wine delicious, which you can see for yourself at a tasting, but also the ambiance, with its rolling country hills, is perfect. For romance, look no further than Glen Gordon Manor in Huntly, Virginia. Stay where the British royal family stays. The Manor is a rustic bed and breakfast with a newly renovated West Wing, spa, and restaurant. Walk into the fire-lit entrance hall and disappear into the romantic past for a weekend of southern hospitality. The Goodstone Inn and Restaurant is a luxurious retreat for those in the market for an at-home feel but surrounded by the finer things in life. The Inn has six guesthouses, each with their own unique charm. The farm-to-table gourmet restaurant serves meals with ingredients from the farm on site, and the wine cellar offers wine from all over the world. The Inn has won innumerable awards, and would be included on anyone’s romantic shortlist. The historic Grandin Village recently made World Property Journal’s top 10 Valentine’s Day Getaways list, along with world-class cities Venice and Hong Kong. The core to Grandin Village is the historic Grandin Theatre, a restored 1930s marvel that serves “the best popcorn in Blue Ridge.” The culture and locally-owned shops and restaurants promise that there’s always something to do or see. If you can’t make it to Italy this holiday, Grandin Village has delights all its own. When visiting Old Town from earlier in the list, you might take a stop at the Kimpton Lorien Hotel and Spa. Awarded the Certificate of Excellence from TripAdvisor and World’s Best Award for Best Hotels by Travel and Leisure Magazine, the Kimpton Lorien Hotel and Spa doesn’t disappoint. The spa has five treatment rooms with offerings such as massages, facials, and scrub sessions. Stop by one of the two award-winning restaurants on sight for dinner. Listed on The Municipal’s 2014 list of Top U.S. Towns for Romance, Harrisonburg, Virginia, is a beautiful town in the Shenandoah Valley. Gorgeous mountain views, private cottages, rolling farmland, and a bustling downtown make for an energetic, yet romantic retreat. Stop in at Clementine’s or The Artful Dodger for live music, walk around the romantic city hall, or go for a drive down Port Republic for a night well spent. If you’re in search for the perfect dinner date location, Terrapin Restaurant, moments away from the Virginia Beach oceanfront, might be for you. The Terrapin has won the AAA Four Diamond Award every year since 2008, and has been included on many top restaurant lists from around the country. The menus are subject to change based on availability and seasonality, but you’re always in for a fine dining experience. Most ingredients are locally sourced, with a full list on the restaurant’s website. La Petite Auberge Restaurant and Lounge has been a Fredericksburg staple since 1981. The restaurant serves traditional French cuisine. The menus are composed daily. Take a walk down the historic downtown district of Fredericksburg before settling in for a true French dining experience. The Amber Lantern Restaurant is located at the Top Rack Marina. Enjoy the fine dining while watching boats go by on the Chesapeake Bay. Many diners come to the restaurant by boat, while others use helicopter to get a table. The food is upscale, so make sure you’re in the mood for fine dining. For romance in Norfolk, Virginia, one could do no better than the historic Freemason Abbey Restaurant. Originally built as a church in the 1800s, it is now a fully refurbished restaurant serving American food. Many of the original fixtures are exposed, creating a one-of-a-kind ambiance and dining experience. It is at once casual and warm, while evoking a relaxing and exhilarating past. Enjoy fresh seafood as well as steaks and other American fare.